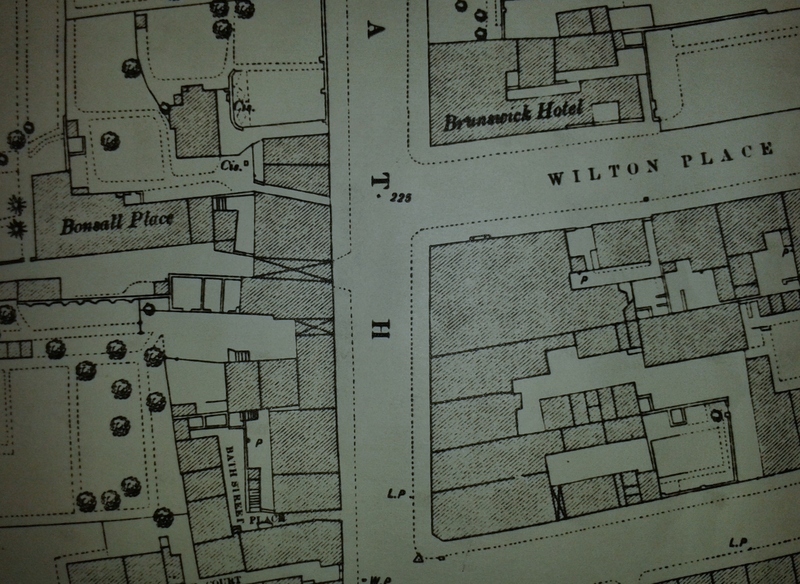 The Brunswick Hotel stands at the corner of Wilton Place, built by Mr. Wilson. Builder and joiner Joseph Wilson Wilton was born about 1818 in London. Signing himself as Joseph Wilson, he married Mary Hallsworth in 1840, his father being recorded as joiner William Wilton Wilson. Mary was the daughter of Cotmanhay framework knitter Joseph Hallsworth and Phoebe (nee Allen). On all censuses until his death he appears as Joseph Wilson. He died at Wilton Place on March 5th 1868 when he was recorded as Joseph Wilson Wilton. The deaths of his parents are also recorded as Wilton. In the summer of 1853 the Pioneer reported that Joseph Wilson, then living in London, had auctioned off several building plots of land in Bath Street., just two minutes walk from the Town Station and the Baths …. with an extensive frontage to Bath Street. The auction was held at the Sir John Warren Inn, 15 parcels of land being sold off, prices ranging from 2/6d to 7/9d per yard. … the auctioneer was John Ross alias John ‘Robins’ of Bath Street. “We hope that the opportunity thus afforded by this sale for building speculations, will lead to the erection of such a class of dwelling-houses, as will be an improvement on the stereotyped style of house-building hitherto adopted in the town, and by the display of a little architectural taste, prove not merely an ornament to the town, but an inducement for the location of respectable families”. One such family which might have met with the approval of the newspaper was the one we are about to encounter. The land between Mr. Moses Mason’s house and Mr. Fletcher’s was not built upon for some years. Then two young men named Woolliscroft took the new shop next to Wilton Place, built by Mr. Wilson, and started in business as drapers. Born in Abbots Bromley, Staffordshire, the ‘two young men’ were Charles and William Woolliscroft, accompanied by their mother Sarah, who came to Ilkeston in 1854. Their baptism records show that, like their sister Fanny, they were the illegitimate children of Sarah .. their father was William Charles, a farmer/ small landowner. Hence their names were Charles Charles Woolliscroft, Fanny Charles Woolliscroft and William Charles Woolliscroft. The 1841 Census records the Woolliscroft family at High Street in Abbots Bromley, Staffordshire where the two women were ten years later. Charles was then a young carpenter in Walsall while William was serving as an apprentice draper. William Smith recalled Charles Woolliscroft and his brother William, who together “proved valuable acquisitions (to the Wesleyan Movement), and helped to strengthen the small and feeble band who were standing in the front line of defence (against the Wesleyan Reformers)”. (see The Wesleyan Methodist Chapel). Charles and his subsequent wife Amelia were devout Wesleyan Methodists and he was a local preacher for over 50 years. White’s Directory of 1857 shows the brothers as linen and woollen drapers at Bath Street. William married Sarah Stanesby, daughter of cooper William and Sarah (nee Lovegrove), in August 1860. The 1861 census confirms Charles at Bath Street while William has moved to live in New Street. The dissolution of the partnership of C. and W. Woolliscroft occurred in April 1862 and a few months later the business of C. Woolliscroft appeared. In the early 1860’s William and family moved out of Ilkeston, initially to Uttoxeter and then on to Dewsbury, Yorkshire in the later 1860’s. Here he set up his drapery business in Westgate. By the end of the century he was retired, living at Wetherby with his second wife Jane (nee Bowes) whom he had married in December 1871 – first wife Sarah had died at Dewsbury in 1869. Jane died in 1903 and two years later William married his third and final wife, Mary Bassett Wright. On Sunday October 20th 1878 P.C. Marshall was patrolling Ilkeston Road in Radford at half past one in the morning when his path was crossed by young James Pendergast. The latter had no boots on and when questioned, said that he had just walked from Ilkeston and his feet hurt him so that he had pulled off his boots and put them in his overcoat pockets. This drew the P.C.’s attention to the coat which was brand new, and he didn’t believe James’s story that he had bought the coat in Nottingham some time ago. The policeman’s suspicions led to James being locked up and appearing before the magistrates the following morning, when a remand was requested. By this time James had remembered that he had bought the coat in Hull !! In fact the coat had last resided outside the front door of the Woolliscroft store in Ilkeston, and was identified by Abraham Blood, assistant at the store, who last saw it hanging there at 6 o’clock on the evening of October 19th. The latter had not realised it was missing until it was brought to him by P.C. Marshall. James now confessed to the theft and pleaded intoxication as an excuse. In January 1879, at the Assizes, the 20-year-old youth received 18 months for the theft. In February 1910 and aged 79 Charles Woolliscroft died at ‘Inglewood’ off Pimlico Lane (later West End Drive). He had been in poor health for a couple of years and for two months had been confined to his house. He was buried at Stanton Road cemetery. His wife Amelia died at the same home address, ten years later, aged 87. 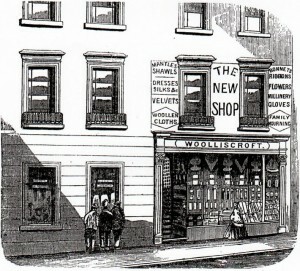 The Woolliscroft store traded until 1937. The sister of Charles and William — Fanny Charles — married painter and glazier Thomas Lyons at St. Nicholas Parish Church in Abbots Bromley on October 24th 1854. Seven weeks later she was buried at the same church, aged 22. * In 1834 the Poor Law Amendment Act was passed, radically altering the old system of providing for the poor which had existed from the beginning of the seventeenth century. A central Poor Law Commission was established to oversee the national system. This became the Poor Law Board in 1847 and then the Local Government Board in 1871. Parishes were grouped into about 600 Poor Law Unions across the country, each with its own Board of Poor Law Guardians, elected by local ratepayers and responsible for providing poor relief in the area. Ilkeston was one of 43 (initially) parish districts of the Basford Poor Law Union and elected two members to its Board of Guardians. Each Union had its own Union Workhouse which, in theory, the poor had to enter in order to qualify for relief. The workhouse master and the matron were two of the several paid officials working for the Union. Shardlow Union Workhouse was at the edge of Shardlow Village. Another paid official was the Relieving Officer who was responsible for assessing the circumstances of those applying for relief. We are now approaching the Bath Street – Station Road corner, and as we do so, we pass the premises of Joseph Fletcher and William Wade.